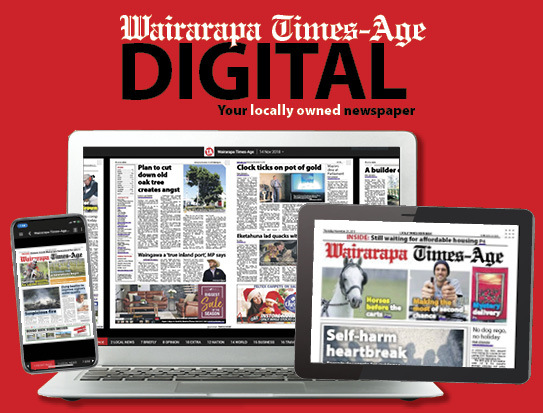 It was a windy day in Featherston last month when 90-year-old Rhona Fraser was knocked off her feet at her rural property. She was stranded for almost 22 hours, painstakingly bum-shuffling her way home to get help. But she never quite made it back inside. Rather, she owes her life to a chance delivery of home kill sausages but says she would have been fine if she had been wearing her medical alarm. Now, she is urging others to wear their alarms at all times, just in case. Rhona was the first woman after World War II to gain her private pilot’s licence, and to fly solo in a tiger moth from the Wellington Aero Club. 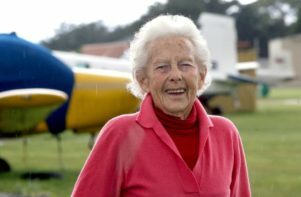 She also established the New Zealand Association of Women in Aviation 58 years ago to support fellow flyers. And it seems Rhona also enjoys flying solo through life, opting not to wear either of her two medical alarms, one for her neck and another for her wrist. All that will change now though, she said. It was 2.30pm on Saturday, July 21, when Rhona was knocked over by the wind outside. She had been feeding her cows. “That’s when I heard the wind coming. “I was hoping to get inside before the wind got to my area. She said it didn’t matter what she had tried to do, she just couldn’t get back up. “I tried using a farm gate to help me get up – but I couldn’t get up. She knew she would have to climb under the gate to get out because she couldn’t get up to open it. Once in the car port, Rhona tried grasping at things around her to pull herself up. She said it would have been about midnight when she started to feel “very exhausted”. She laid back on to the earth floor of the car port to rest – “it’s a bit irregular with stones . . . it wasn’t very comfortable”. 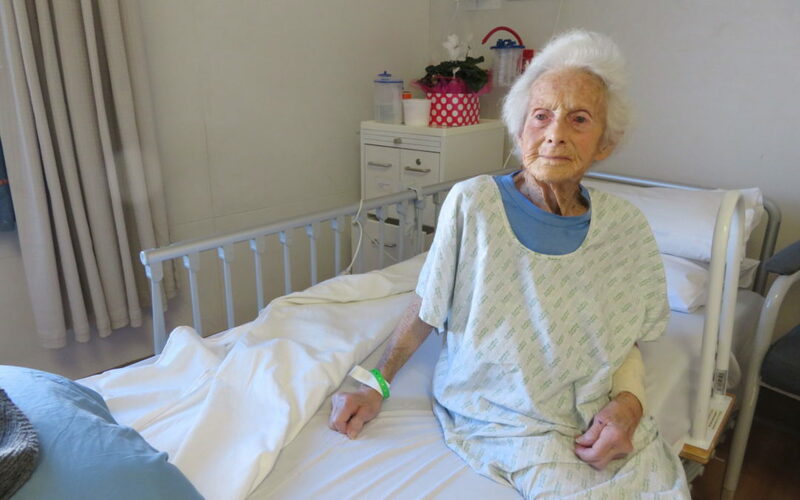 Rhona laid there until midday on Sunday – almost 22 hours after she fell. In that time, she had no access to food or water. Luckily at midday on Sunday, Rhona’s home care assistant called in to drop off some home kill sausages. “On the Friday, she had said to me, some time over the weekend, I will drop you in some home kill sausages. 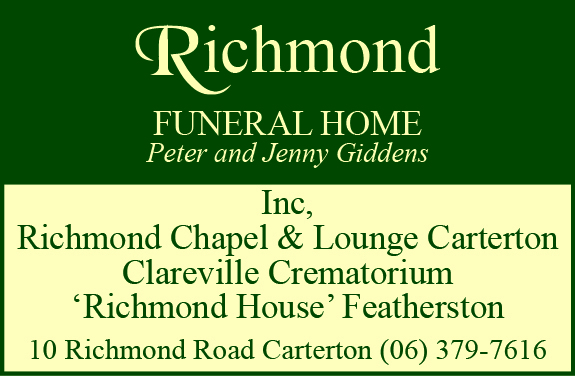 Rhona was taken by Wellington Free Ambulance to Wairarapa Hospital. She is being treated for three broken ribs on her right side, and one on her left. “It doesn’t matter whether you breathe deep or shallow – the pain gets you,” Rhona said. Her weight had also dropped to just 39kg. “The worst thing is that I haven’t been able to taste the sausages,” she said. Rhona hoped that by sharing her story, other people with medical alarms would be encouraged to wear them at all times. “I must say, I didn’t shed a tear – I think it was down to sheer pig-headedness. “Because I still believed in my heart that there must be a way. “But if I had been wearing my medical alarm, I would have got help earlier. Hope you have a speedy recovery. Had to read your story to les as he forgets to wear his alarm.